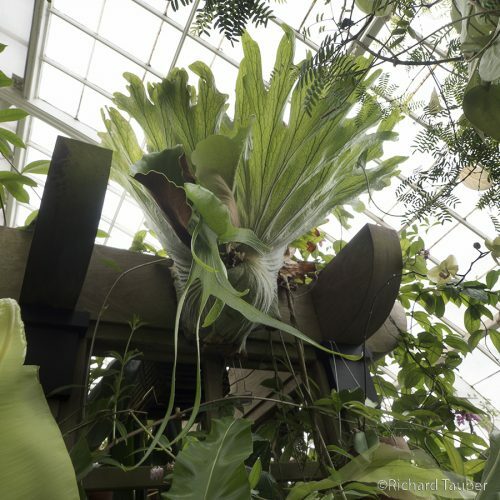 The Potted Plants Gallery pays homage to the Conservatory’s late 1800’s Victorian roots when plant collectors stored their exotic tropical treasures in opulent glass greenhouses to protect them from cold European climates. Rare flowering plants are potted in an incredible assortment of decorative urns and containers from all over the world including copper containers from India, Javanese palm pots, ceramic pots from Burkina Faso and a historic urn from San Francisco’s 1915 Panama-Pacific International Exposition. Cymbidium are noteworthy because although there are approximately only 44 species, thousands of hybrids exist. Many of the showier hybrids have large striped petals and sepals and a ruffled lip of a contrasting color. 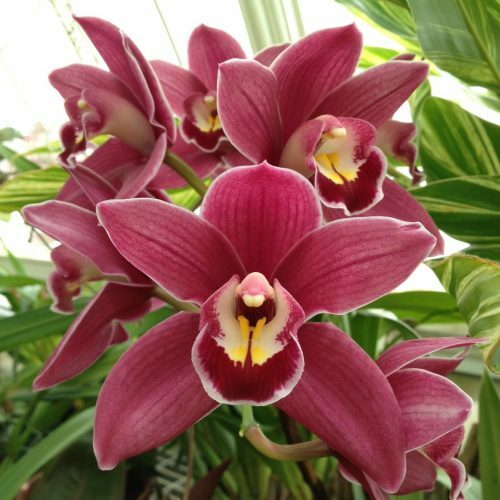 Cymbidiums are popular in the florist trade for corsages and floral design. Cut flowers last for weeks. They are widely grown in Bay Area gardens and bloom in the winter. Heliamphora is a genus of approximately 23 carnivorous plant species. 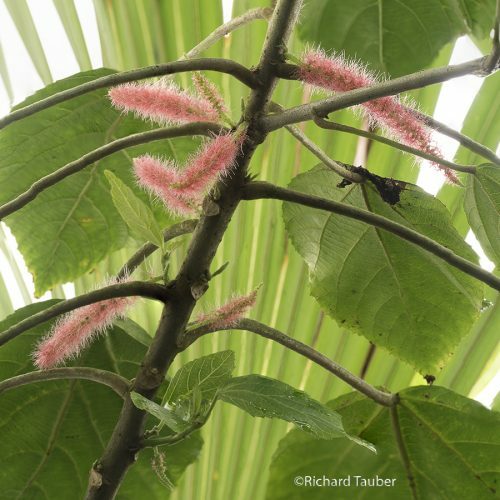 Plants of this genus are endemic to Venezuela, Guyana, and Brazil. Most Heliamphora species are found growing on the Tepui mountains of the Guiana Highlands. The Tepuis are remote table-top mountains that rise out of the tropical landscape below to heights of 10,000 feet with sheer, vertical cliff faces. Conditions are extreme on the top of Tepui mountains: frequent and torrential downpours are accompanied by high winds and lighting, temperatures can dip to near freezing, and vegetation is sparse due to the limited and nutrient poor soil. Plants of the Heliamphora genus have evolved and adapted to the harsh conditions found on these plateaus. The pitchers of Heliamphora are modified leaves that act as sophisticated traps. The bell-shaped pitchers arise from rhizomes anchored by the roots. A small lid, known as a nectar spoon, sits at the top of the pitchers and secretes nectar that lures insects into the top of the pitcher where fine, downward hair force the insect further down and prevent escape. Eventually, the insect falls down into a pool of rainwater at the base of the pitcher, where it drowns and is dissolved by a community of bacteria living in the pitcher. 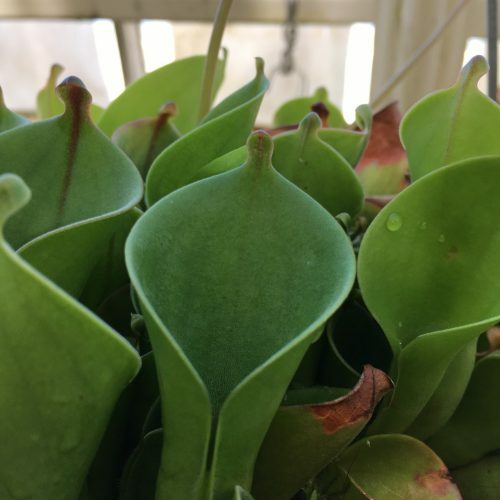 Heliamphora gets its name from the Greek roots helos (marsh) and amphoreo (vessel or pitcher). 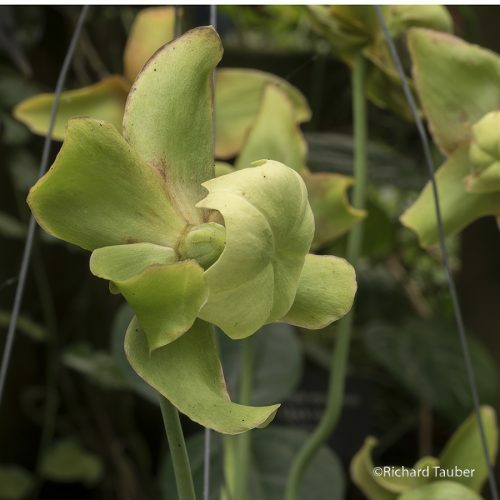 Interestingly, the common name for the genus, sun pitcher, is derived from the misinterpretation of helos for the similarly spelled root helio (sun), hence the mistaken identity. 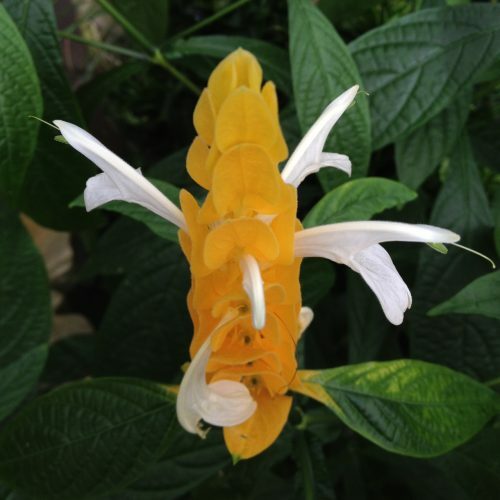 Pachystachys lutea is a popular landscape plant in tropical and subtropical areas of the world. The plant’s long-throated, short-lived white flowers emerge sequentially from overlapping bright yellow bracts. A bract is a modified leaf. Some bracts are brightly colored and serve the function of attracting pollinators. Others protect flowers as they emerge. Bracts are often different from foliage leaves. They may be smaller, larger, or of a different color, shape, or texture. Most Paphiopedilums are lithophytes (plants that grow on rocks) found mostly on limestone cliffs or in humus enriched forest floors. Virtually all species require shade of a forest canopy. Most species temporarily trap their pollinator in their pouch-like lip and none are known to offer any reward. Insects are lured in by the smell of nectar. Numerous species attract flies or bees with odors that range from foul to pleasant depending on the type of pollinator. 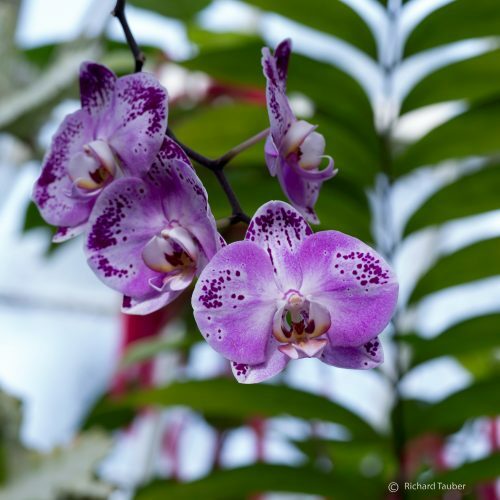 Phalaenopsis orchids are perhaps the most easily recognizable orchids and the most popular orchid genus in cultivation. The genus is composed of approximately 40-50 species that grow natively across Southeast Asia from the Himalayan Mountains to Australian. Phalaenopsis thrives in three distinct habitats: seasonally dry, seasonally cool, and constantly humid and warm. Phalaenopsis orchids produce a large spray of flowers that can bloom for several weeks. There is a great diversity of color between species with flowers showing spotted, marbled, or barred color patterns. 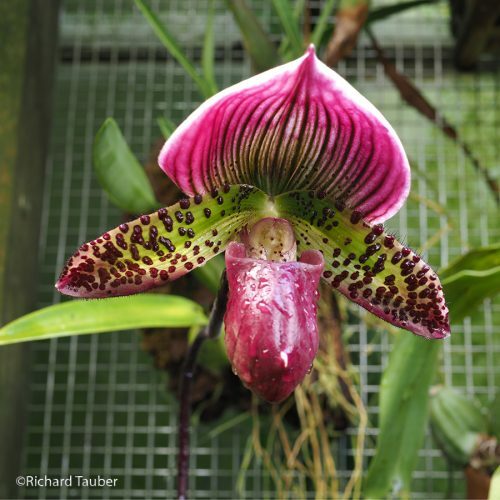 The shape of the flower is thought to resemble moths in flight, which contribute to the common name the moth orchid. The beautiful blooms and hardiness, in combination with the ease of hybridization, have contributed to their success as popular houseplants. Phalaenopsis orchids were some of the first tropical orchids in Victorian collections. Sarracenia is a genus comprising of about 10 species of North American pitcher plants. Like the more famous Venus flytrap, these plants are carnivorous. But unlike the fly trap, which moves to trap its prey, the Sarracenia has a passive trap. The plant’s leaves have evolved into a funnel-shaped pitcher. Insects are attracted by a nectar-like secretion on the lip of pitcher, as well as a combination of color and scent. Slippery footing at the pitchers’ rim causes the insect to fall in. Once inside, tiny downward-facing hairs make it nearly impossible for an insect to crawl back out, and liquids at the bottom of the pitcher make tiny wings too wet to fly. Sarracenia are often found in hot, sunny bogs of Texas and the east coast of the United States. Bog soil is acidic and lacks nutrients so digested insects serve as an important source of nourishment for the plants. When blooming, the Sarracinia’s dramatic umbrella-like flowers are usually on long stems well above the pitcher, to avoid trapping potential pollinators. Staghorn ferns have two types of fronds, basal and fertile. The sterile, oval-shaped, basal fronds not only help the plant adhere to trees, but also cover the roots to protect against damage, capture rain water, and trap leaf litter that decomposes and provides the plant with nutrients. The antler shaped fertile fronds hold the reproductive spores.